The headwaters of the San Antonio River originate in Bexar County, from which it begins a 240-mile journey through six counties toward San Antonio Bay and the Gulf of Mexico. From Spain’s colonization efforts to the emergence of San Antonio as the second most populous city in Texas, the area’s rich history and culture have been shaped by the San Antonio River. Historically, the urbanization of San Antonio and the introduction of flood control measures have eroded the public’s relationship with the river and negatively impacted local ecosystems, as evidenced by poor water quality caused by bacteria and the disappearance of migratory bird species that used to frequent the waterways. The Urban Waters Federal Partnership (UWFP) was launched in 2011 to promote collaboration between federal agencies and local partners in urban communities, with the goal of restoring waterways. Around this time, the San Antonio River Authority (SARA) partnered with the US Army Corps of Engineers, City of San Antonio, Bexar County, and the San Antonio River Foundation to restore eight miles of the San Antonio River that flowed through the San Antonio Missions National Park. Discussions led by the City with Bexar County, SARA, the San Antonio Housing Authority, and San Antonio Water System turned to how the group could become part of the UWFP and increase the pace of improvements in local waterways. In 2013, under the City’s leadership, local partners met with the Environmental Protection Agency and the Department of Housing and Urban Development to help bring this idea to fruition. The City applied to join the UWFP and was approved in 2014, becoming the first city among 19 designated UWFP locations across the United States. Today, the San Antonio Urban Waters Federal Partnership includes 11 federal agencies, 8 state agencies, 11 local government partners, and 22 community stakeholders. While the partners are quite diverse, they share common goals: to work together to improve water quality in the San Antonio River basin within Bexar County and to revitalize communities’ relationships with their local waterways. The San Antonio Missions, which consist of five colonial complexes dating back to Spain’s colonization efforts in the 18th century, are situated along a 12-mile stretch on the San Antonio River. Spanish colonialists used mission institutions to facilitate the transfer of Spanish culture to the indigenous people of the area. In 2015, the San Antonio Missions were designated a World Heritage Site by the United Nations Educational, Scientific, and Cultural Organizations (UNESCO). This designation provides educational opportunities about the cultural and historical impact of the Missions and draws international tourism, which has a significant economic impact on the area. It was estimated that in 2016, the Missions National Historical Park supported more than 2,300 local jobs and contributed over $200 million in economic activity to the area. 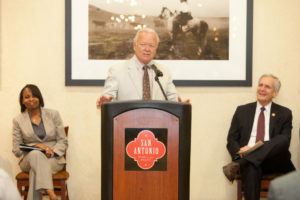 The National Park Service, San Antonio Conservation Society, San Antonio River Authority, and Bexar County—all members of the Partnership—are in the process of identifying ways to connect the Missions to the sites and routes along the El Camino Real de los Tejas National Historic Trail to further increase recreational opportunities, awareness of the area’s history, and economic development. The federal partnership not only implements projects to connect the river to the fabric of the city’s culture and history; it also pursues restoration activities that are improving water quality and encouraging people to become physically connected to waterways through green spaces and trails. A couple examples include the San Pedro Creek Improvements and Westside Creeks Ecosystem Restoration projects. In the 1960s and 1970s, flood prevention efforts on San Pedro Creek and three other Westside creeks (Apache, Alazan, and Martinez) stripped the creek of its natural function and created a disconnect between the waterway and the community. 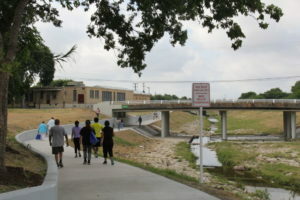 The San Pedro Creek Improvements and the Westside Creeks Ecosystem Restoration projects will restore the creeks to functioning ecosystems, improve flood control, add green spaces, provide hike and bike trail connectivity, and potentially catalyze further economic development opportunities in San Antonio. Restoration activities began in 2016 and will have significant impacts by reconnecting people to the waterway and boosting the local economy. The restoration of San Pedro Creek and its trails will tie in the west side of San Antonio with the rest of the downtown and the World Heritage Site along the earlier Mission Reach project. Once completed, the River Walk on the San Antonio River will connect to the San Pedro Creek trails, attracting tourists and users of the River Walk to the west side of the city. This project will have significant economic impacts by promoting economic activity downtown, increasing property values from beautification, and encouraging new construction of housing and businesses in the area. The projects being implemented by the San Antonio Urban Waters Federal Partnership are multi-year projects, with many of the restoration efforts still in the early phases. Because the San Antonio community has recognized the value of implementing these projects, public support for them has grown significantly. When the proposal for the trails and restoration projects first appeared on the ballot, it passed with approximately 60% of the vote. 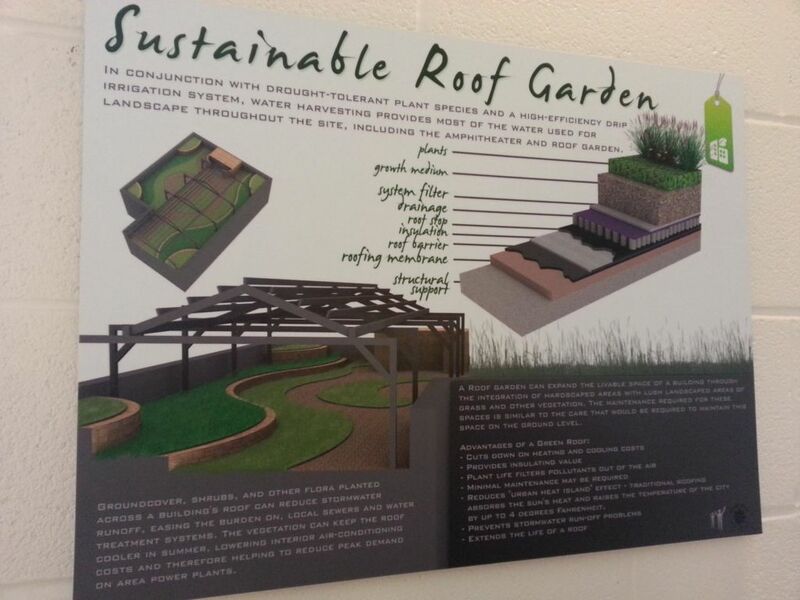 Today, the public continues to support the allocation of funds for these projects. 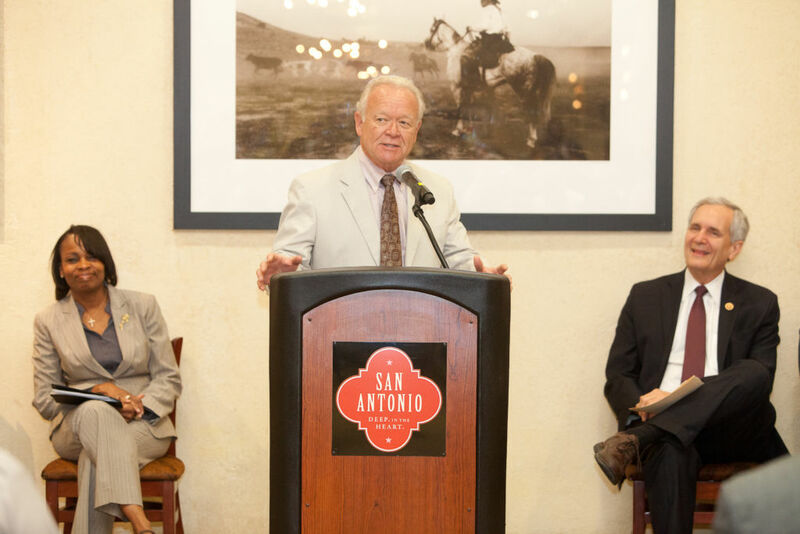 As more people learn about San Antonio’s rich history and see significant improvements to their quality of life and to the local economy, this Urban Waters Federal Partnership will continue to flourish. San Antonio River Authority (SARA) is one of the founding organizations of the UWFP and has spearheaded many of the partnership’s projects (San Pedro Creek Improvements and Westside Creeks Ecosystem Restoration projects). SARA’s Mission Reach Ecosystem Restoration and Recreation project with the Army Corps of Engineers paved the way towards the federal partnership. This project began in 2008 with a goal of restoring 334 acres of riparian areas and 113 acres of aquatic habitat that were lost due to the channelization of the San Antonio River from 1954. SARA was initially created in 1937 as the San Antonio River Canal and Conservancy District, whose mission was to build a canal to transport goods between San Antonio and the coast of Texas. After a devastating flood in 1946, the District goal shifted to flood control. In 1953, the District was renamed San Antonio River Authority. With the San Antonio River still experiencing damaging floods, SARA strives to make the basin more resilient and sustainable. Past practices for the River and its tributaries were realignment and channelization, as well as construction of underground channels to divert floodwater from the city central districts. Today, SARA focuses on achieving “the triple bottom line”: being good for the environment, good for people, and making sound financial sense. Incorporating techniques such as low impact development, green infrastructure, and natural channel design combats floods, improves the basin’s stormwater infrastructure in a cost-effective manner, and enhances quality of life by increasing green space. Use of these techniques also reduces stormwater runoff, decreasing both nonpoint source pollution and bacteria such as E. coli, the largest pollutant of concern in the basin. On-the-ground projects are key for SARA. Working hard to achieve its “triple bottom line,” SARA has developed manuals and protocols for Low Impact Development (LID) and Natural Channel Design (NCD), which provide specifications for Best Management Practices, enabling property owners, policy makers, and citizens to learn how to implement the techniques. The LID manual covers how to develop LID training programs for developers, engineers, architects, and landscape architects. The NCD manual provides a Standard of Care criteria for creating NCD projects and Standard Operating Procedures for engineers, SARA staff, and others to ensure that projects yield the desired results. Looking forward, SARA continues to develop programs, restoration efforts, and flood control measures to extend its impact on the San Antonio basin and address the water quality and quantity issues the river faces. Learn More about the San Antonio Urban Waters Partnership Projects. The San Antonio Urban Waters Federal Partnership includes 11 federal agencies, 8 state agencies, 11 local government partners, and 22 community stakeholders who all work together to restore damaged ecosystems, develop trail systems, improve water quality, and mi gate ooding within the San Antonio River Basin.